When the gelcoat on your boat has faded, it can make your boat look dull, tired and lacklustre and can certainly make you lose your enthusiasm for its appearance. Through damage caused by the elements, the soft surface of the gelcoat is eroded and can leave it looking chalky and dull in its appearance. However, restoring your gelcoat is one of the easiest boat tasks that you can undertake and is easy to do yourself. To help to restore the color, shine and appearance of your boat, choose a gelcoat restorer. Gelcoat restorers are suitable for fiberglass (GRP) gelcoats and can help to give long lasting effects, wetting the pigment to restore a strong and vibrant color and shine. Rather than waxes and polishes which simply sit on the surface and will not have lasting results, Owatrol’s Marine Polytrol penetrates deep into the material to help to protect against corrosion and blemishes, helping you to not only restore your gelcoat but also make maintenance much easier. 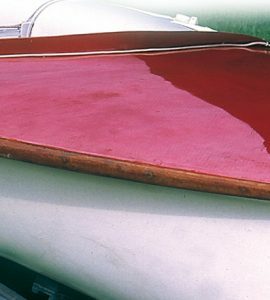 While it is natural for time and exposure to erode the appearance of a gelcoat, by restoring it, you are not only making your boat more pleasing to the eye, but you are enhancing the value of your boat and making it last longer. The beauty of Marine Polytrol is that you don’t need expensive waxes or polishes that merely sit on the surface. Applying waxes can be time-consuming and is often a fruitless task, with Gelcoat Restorer you know that the formula is penetrating deep within the gelcoat to give long-lasting and more effective results which restore the pigments while eliminating the need for more frequent maintenance and re-waxing. Firstly, tape off and protect all of the areas of the boat you don’t want to treat. Thoroughly clean the boat, this can be done with soapy warm water or more effectively with Deck Cleaner. If you have any mildew then use a bleach-based solution to get rid of it. If there is waterline scum or limescale you should use a more specialist cleaner to remove it. With Marine Polytrol, drying times are short (usually less than 10 minutes) so section off your work in small, achievable areas. Soak a soft, clean cloth in Marine Polytrol and wipe onto the gelcoat, remembering to wipe off the excess liquid as quickly as possible. (Failure to do so may result in a patchy and uneven appearance). Gently shine the gelcoat with a lint-free cloth to achieve a superior sheen. For best results when using Marine Polytrol, do not apply in direct sunlight or when the gelcoat surface is hot to the touch. Marine Polytrol is designed to restore pigment, color and shine to the gelcoat, so it is not suitable to be used on white surfaces. With Marine Polytrol, maintenance is easy. The results are long-lasting but when you see they are fading, simply repeat the easy process again.